The Harbor houses 2,500 yachts within its two marinas, inside a one-and-a-half mile jetty. Complete harbor facilities include guest slips, a fuel dock, shipyard, launch ramp, boat rentals, yacht sales, community class instruction for all ages, fishing, windsurfing, jetskiing, kataking, boat charters, two yacht clubs, sailing association, ocean classroom labs, shops, restaurants, picnicking and a baby beach for young swimmers. Dana Point is ideally located and is said to be a reference landmark for the Whales by many Ocean Naturalists. Dana Wharf Sportsfishing captains are very experienced, and will educate you on the whales and dolphins. Whale Watching excursions departs daily, and there is an option to buy tickets on-line! Situated next to Dana Point Harbor with easy access to restaurants, Dana Point Marine Life Refuge, swim beach and tide pools. Facilities include, Lifeguards, food & drink, rest rooms, showers, picnic areas, and fire rings. There are 120 tent and RV campsites as well as bike paths, campgrounds, rentals, hiking, surfing and volleyball. Located just nor of Laguna Beach, this beautiful stretch of land features rustic, overnight campsites, a stretch of coastal cliffs and a beach front cove sandwiched between Pacific Coast Highway and the Pacific Ocean. Crystal Cove is used by mountain bikers inland and scuba and skin divers underwater. The beach is popular with both swimmers and surfers. A non-profit, volunteer organization and education center. They rescue, rehabilitate, and release sick and injured seals and sea lions. Programs include a guided tour of the animal care facility and exhibit room, a slide presentation and observation of the animals. Located just steps from the Pacific Ocean in Laguna Beach. Museum visitors can enjoy continuously changing exhibitions of works by historical, contemporary, and emerging artists and browse through the Museum Store and Art Rental and Sales Gallery. Also offering classes for children along with lectures, concerts, and exhibitions. West Coast's oldest continuously operating theater companyoffering a 5-play main stage season and a 4-play children's season in the beautiful 400 seat Moulton Theater. Season runs September through June. Quaint and picturesque, this is where locals and tourists alike spend their time. Attractions include: basketball courts, volleyball courts, downtown boutiques and galleries, plus world-class restaurants. Overlooking San Clemente pier, this 1928 estate was the home of the city's founder, Ole Hanson. The renovated 2.4-acre site features historic exhibitions, literary symposia, musical attractions, special events, and diverse educational and cultural opportunities that encourage visitors to explore the Romance and Reality of the Southern California experience. This captivating 66-seat theater was converted from one of the city's historic buildings from the 1920's. Founded in 1953, the playhouse has been delighting audiences with it's productions ever since. The pier is 1,200 feet long and was built in 1928. It's a wonderful spot to take a stroll, watch the surfers, fish off the side or enjoy a meal at the Fisherman's Resaurant and oyster bar. Finding it's home in the beautiful and historic city of San Juan Capistrano ... the Camino Real Playhouse is South Orange County's destination for whimsical, gripping and compelling performances. From their annual worldwide playwriting festival ShowOff! to their annual Shakespeare under the Stars performed in Historic Town Center Park next to the Playhouse. An 8,000 acre protected wilderness preserve nestled among the river terraces and sandstone canyons of the western coastal Santa Ana Mountains. The park has campgrounds, restrooms and showers, picnic areas, an equestrian campground, hiking and equestrian trails and a future visitor center will offer the park user an insight into the park's history, wildlife and plant life. 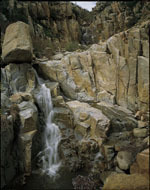 Ortega Highway winds up through the Trabuco Ranger District of the Cleveland National Forest. Along this highway are beautiful hiking trails, campgrounds and scenic stops. A 2.2 acre horticultural retreat. The Gardens provide a museum of living plants, displayed amidst a setting of immaculate gardens, patios and conservatories linked together by wide brick walkways, beds blooming with seasonal flowers and bubbling tile fountains. The Library is a specialized research center devoted to the study of the Pacific Southwest. The Balboa Fun Zone is one of Southern California's oldest and last great coastal amusement areas. Attractions include the old horse carousel built in 1938, a 14-foot trampoline, laser tag, arcade and boat tours. Located on the Balboa Peninsula of Newport Beach. The largest nautical museum in Orange County, California. Includes ship models, ship paintings, and special events. Built in 1914, this 1,750 foot pier was shut down in July 1988 after officials found it no longer was structurally safe. After being rebuilt, it is a blend of old and new in design. 350 acres consisting of beautiful trees and foliage plus six miles of trails. Includes a frisbee disc course, dog park, free concerts, playgrounds and nature center. The Mission of the Huntington Beach Playhouse is to provide the community with the best possible experience and enjoyment available in the cultural arts. Presenting productions in the dramatic, comedy and musical arts for the entertainment of our patrons. Home to a collection of some of the most significant artifacts in the history of surfing. With surf music and videos playing in the background, you'll be in the mood to view the many fine exhibits. Opened in 1974, the Shipley Nature Center is an 18-acre fenced natural area within Huntington Beach Central Park, CA. Named after former Mayor Donald D. Shipley, the center is owned by the City of Huntington Beach. The Nature Center includes 4,000 feet of trails that meander through several habitats, including oak woodlands, Torrey pines, meadows, and Blackbird Pond, a natural freshwater wetland with mature willows and sycamores. Within the Nature Center is a 1,500 sq. ft. Interpretive Building with exhibits on local wildlife and ecology. Naval Weapons Station. Main entrance 800 Seal Beach Blvd. Home to such species as the snowy egret and the great blue heron,this wetlands area is one of the last undeveloped coastal areas in Southern California. Designated by President Nixon in 1972 for the preservation of the environment.